The project is a coordinated effort of five research groups in five research centers in the Comunidad de Madrid. 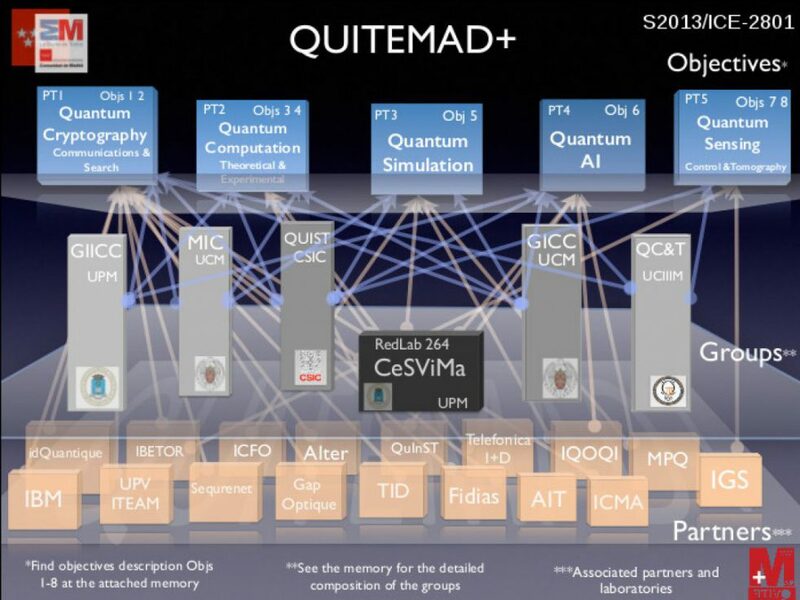 It aims to develop new computation, simulation and communication models based on Quantum Computing and Cryptography. The consortium also includes the Madrid Center for Supercomputing and Visualization (CeSViMa, Centro de Supercomputación y Visualización de la Comunidad de Madrid). CesViMa is a Red Lab Laboratory. The project includes five research areas with important scientific and technological applications, from quantum cryptography at an industrial level, to the development and implementation of new techniques in quantum communications, computing and information. This include experimental proposals and collaborations with leading international laboratories, multinational companies and even SMEs that are associated to the project for its experimental and industrial realization. At the same time, the project also has strategical objectives that include starting new collaborations, fostering talent, attracting new researchers and promoting tenured positions, actions that will establish Madrid at the forefront of the field. This project is financed with European structural funds.